It’s rare that you get the chance to walk out of a cinema feeling like you’ve just witnessed a film which is truly its own product. One that didn’t mould itself to fit preconceived notions or box office predictions. In short a film which has all the makings of a future classic. And yet, by my count we now have had three such films already this year. 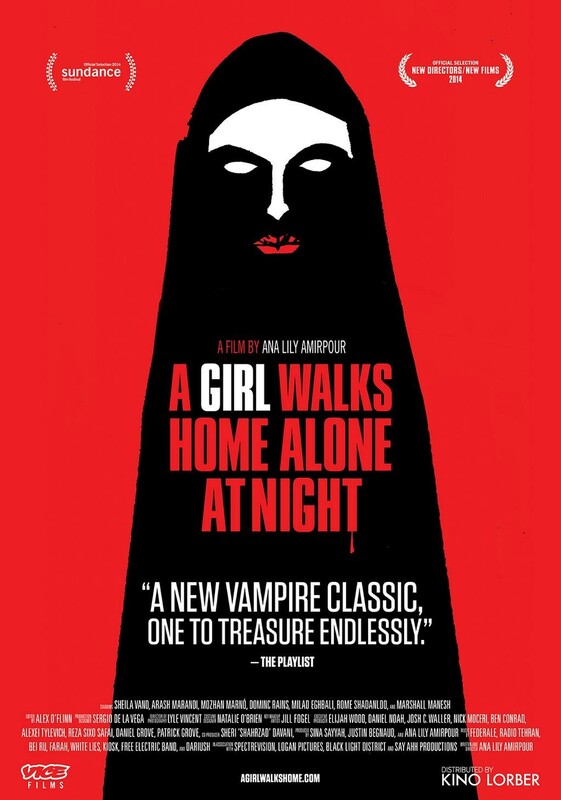 Firstly there was Whiplash, that was followed by The Duke of Burgundy and now 2015 has served up its third exceptional film in A Girl Walks Home Alone at Night. The three films couldn’t be more different from each other as Girl serves up a curious hybrid of vampire myth, Iranian and Western culture and silent cinema which’s charged with a contemporary verve. The film takes place in the fictional Iranian town of Bad City. This is a lawless place where prostitution and drugs run rampant and bodies can pile up without interference from an absent law force. 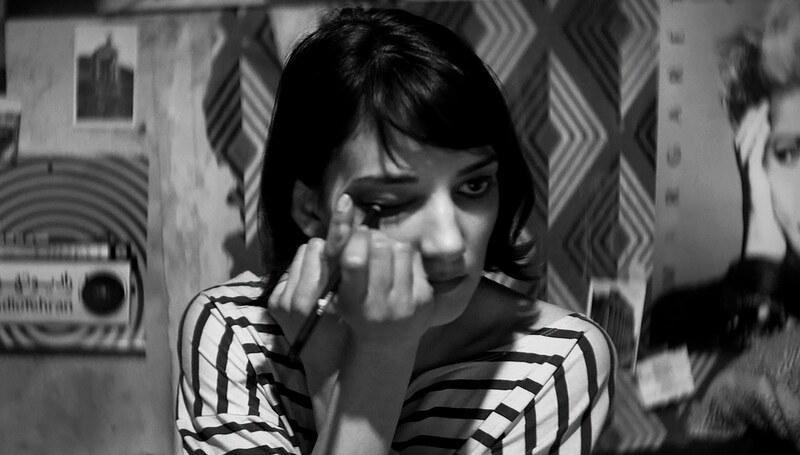 It’s a modern day Western frontier, however its not a Clint Eastwood style antihero who comes wandering into town but a woman simply known as The Girl (Sheila Vand). She’s a vampire who skateboards around town looking for victims to the tune of both Morricone twangs and contemporary music. The Girl is a figure who morphs every time we look at her; at times a likable witty young woman, at others an intimidating force of nature. Vand can quite incredibly shift her over the course of a scene from being a fragile and emotionally vulnerable character to being a spectral creature of the night and back again if she so chose to. We are constantly kept on our toes here as the narrative shifts and flows in ever-changing, unpredictable ways. Every time we begin to settle down with how we expect the film to pan out the figurative carpet is whipped out from beneath our feet again and again until we learn just to go with it as a visceral, remarkable experience. It’s not just the genre and performances which are ever-shifting but the intermingling of pop iconography, ancient tradition, pulp sensibility and politics makes for a fascinating melting pot of ideas. It grants the film a distinctively original air and makes for a joyous, invigorating cinema experience. People are describing director Ana Lily Amirpour as the next Tarantino, but I can’t help but think of this as an unhelpful comparison. Not only because they don’t share the same canvas of violence but also because her celebration of pop culture isn’t used in a particularly comparable way, nor does it achieve the same end. Whereas Reservoir Dogs in some ways feels restrained Girl is an exuberant mesh of influences from across history and different cultures. It’s own beast and deserves to be seen, not only by arthouse fans, but any serious fan of film and cinema. What is the film’s greatest strength? The exuberant mash-up of highbrow art, cinematic genres and comic book pulp. Its greatest weakness? There isn’t a glaring weakness, it’s pretentiousness is made acceptable by its total commitment to its own cinematic fetishes. Would I see it again? Absolutely. It’s a future classic and should be cherished. Looks like an interesting one. It really is, do you think you’ll try and check it out? Yeah, I’ve written the title down so I can look out for it later. Ah excellent! You’ll have to tell me what you think if you do end up seeing it. Great review! 🙂 I really need to see this one… All the reviews have been so positive. Hopefully you’ll enjoy it. The worry is of course that you’ll go in with heightened expectations after all of this praise. Great review, man! This looks great! Thanks my friend! It really is a good one if you have the chance to catch it. I agree, she doesn’t need a famous guy comparison. That’s what’s good about her. Exactly, it’s unwarranted and unnecessary. “It’s rare that you get the chance to walk out of a cinema feeling like you’ve just witnessed a film which is truly its own product.” Amen. absolutely. I couldn’t agree more with this statement, especially right now! Great review! I’m glad you liked it! Haha thank you! Did you see (and like) Whiplash or Duke of Burgundy? Excellent! It was a 2015 film for us so it is up against Girl and Duke for me!